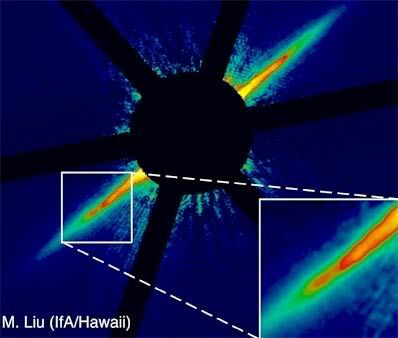 The sharpest image ever taken of a dust disk around another star has revealed structures in the disk which are signs of unseen planets. With eyes sharper than any that have peered at Saturn before, the Cassini spacecraft has uncovered two moons, which may be the smallest bodies so far seen around the ringed planet. The moons are approximately 3 kilometers (2 miles) and 4 kilometers (2.5 miles) across -- smaller than the city of Boulder, Colorado. The moons, located 194,000 kilometers (120,000 miles) and 211,000 kilometers (131,000 miles) from the planet's center, are between the orbits of two other saturnian moons, Mimas and Enceladus. How old is the Milky Way? Observations by an international team of astronomers with the UVES spectrometer on ESO's Very Large Telescope at the Paranal Observatory have thrown new light on the earliest epoch of the Milky Way galaxy. The first-ever measurement of the Beryllium content in two stars in a globular cluster (NGC 6397) - pushing current astronomical technology towards the limit - has made it possible to study the early phase between the formation of the first generation of stars in the Milky Way and that of this stellar cluster. This time interval was found to amount to 200 - 300 million years. The age of the stars in NGC 6397, as determined by means of stellar evolution models, is 13,400 +/- 800 million years. Adding the two time intervals gives the age of the Milky Way, 13,600 +/- 800 million years. The currently best estimate of the age of the Universe, as deduced, e.g., from measurements of the Cosmic Microwave Background, is 13,700 million years. The new observations thus indicate that the first generation of stars in the Milky Way galaxy formed soon after the end of the ~200 million-year long "Dark Ages" that succeeded the Big Bang. How old is the Milky Way ? When did the first stars in our galaxy ignite ? A proper understanding of the formation and evolution of the Milky Way system is crucial for our knowledge of the Universe. Nevertheless, the related observations are among the most difficult ones, even with the most powerful telescopes available, as they involve a detailed study of old, remote and mostly faint celestial objects. NASA has released three new stunning color pictures taken by the Cassini spacecraft exploring the planet Saturn. The images show the giant planet, its golden rings and several moons. 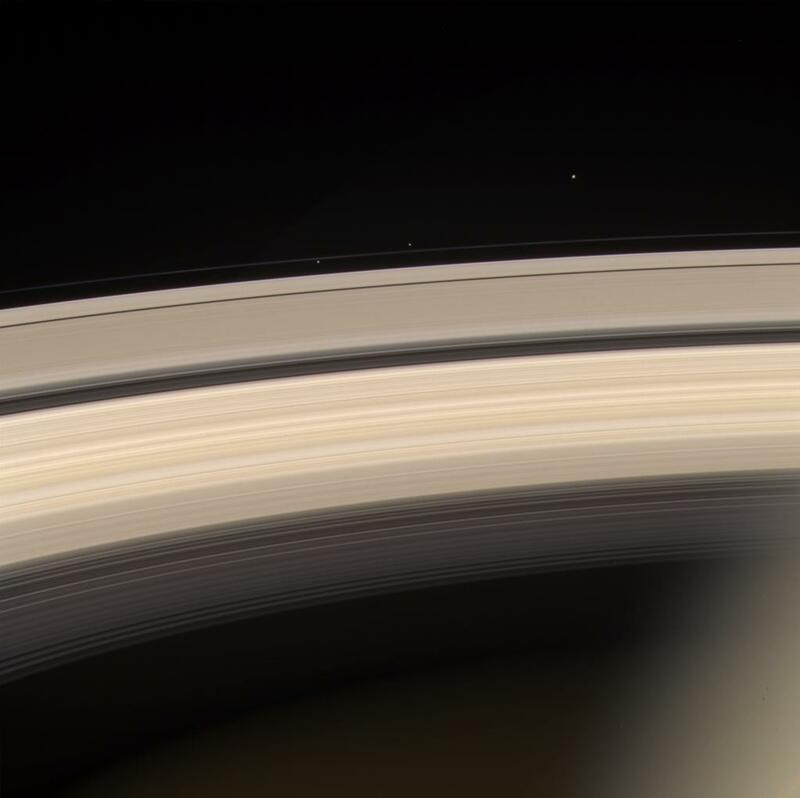 FIRST IMAGE: Saturn's atmosphere is prominently shown with the rings emerging from behind the planet at upper right. 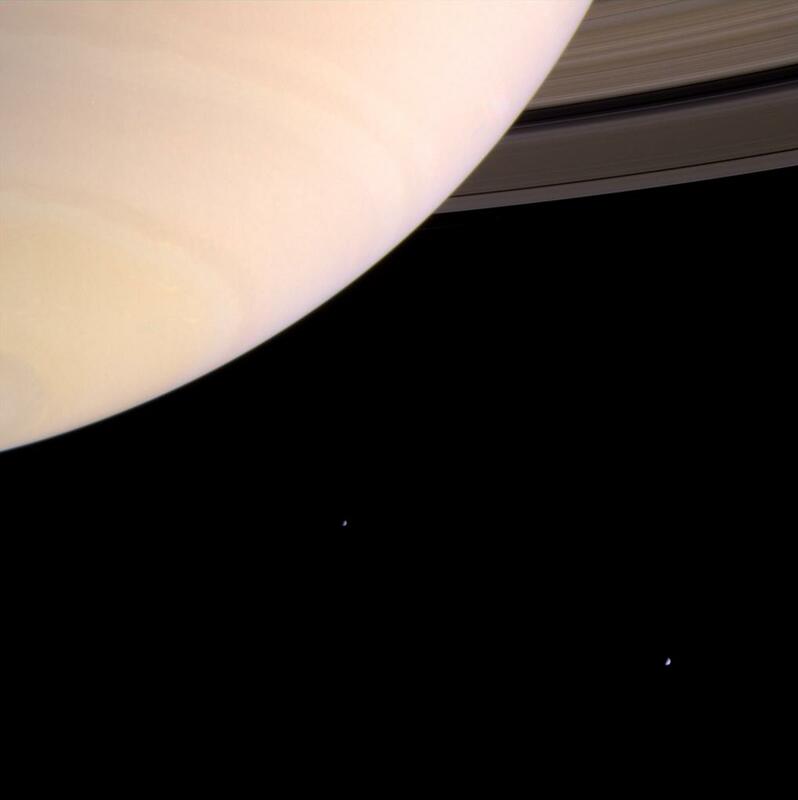 The two moons on the left of the image are Mimas and Enceladus. This image was taken on August 8, 2004, with the Cassini spacecraft narrow angle camera in red, green, and blue filters. 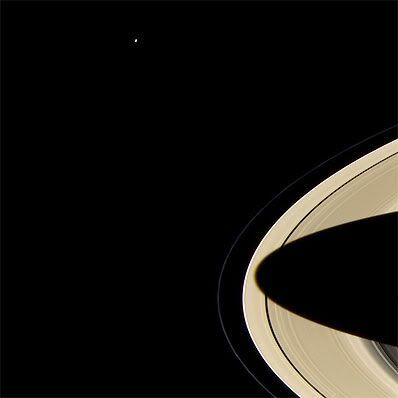 This image was taken 8.5 million kilometers (5.3 million miles) from Saturn. Contrast has been enhanced to aid visibility. SECOND IMAGE: Saturn's rings appear golden as the planet's shadow drapes across nearly the whole span of the rings. 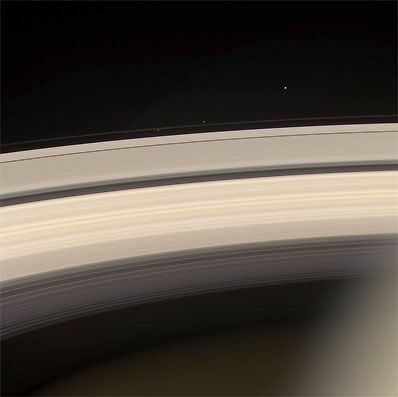 In the upper left corner is Saturn's moon Mimas. 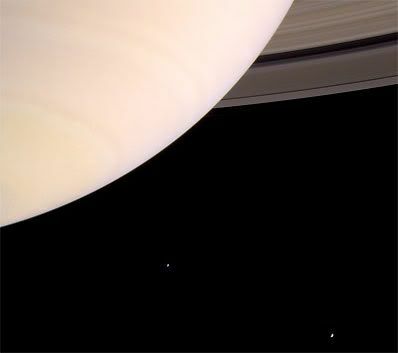 THIRD IMAGE: Saturn and its rings are prominently shown in this color image, along with three of Saturn's smaller moons. From left to right, they are Prometheus, Pandora and Janus. Prometheus and Pandora are often called the "F ring shepherds" as they control and interact with Saturn's interesting F ring, seen between them. This image was taken on June 18, 2004, with the Cassini spacecraft narrow angle camera 8.2 million kilometers (5.1 million miles) from Saturn. It was created using the red, green, and blue filters. Contrast has been enhanced to aid visibility. A virtual reality hand, complete with vital veins, that "feels" could help trainee nurses practise their jabs. The tactile 3D virtual reality system uses force feedback technology that is usually found in video game controllers, known as haptics. 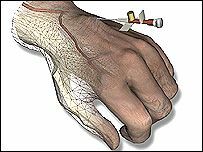 It could help in learning sensitive venopuncture skills on a variety of hand types, instead of plastic models. The system, developed by UK Haptics, is still at an early stage, but could be used for training nurses next year. Haptics is the term for physical sensors that provide a sense of touch at skin level and force feedback information from muscles and joints. Nurses sit in front of a PC wearing 3D goggles. A mirror in front of them lets them see the projected hand image in 3D too. All the nurse has to do is sit in front of the machine and stick the cannula, which they see as a syringe, into the hand. The system feeds back information about pressure, and blood appears to fill the syringe when the vein has been punctured. They didn't have that kind of technology back in the Dark Ages when I was in school. We just got the real thing to practice on. A spectacular new image of Cassiopeia A released today from NASA's Chandra X-ray Observatory has nearly 200 times more data than the "First Light" Chandra image of this object made five years ago. The new image reveals clues that the initial explosion, caused by the collapse of a massive star, was far more complicated than suspected. This spectacular image of the supernova remnant Cassiopeia A is the most detailed image ever made of the remains of an exploded star. 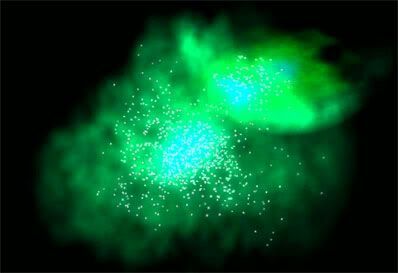 The one million second image shows a bright outer ring (green) ten light years in diameter that marks the location of a shock wave generated by the supernova explosion. A large jet-like structure that protrudes beyond the shock wave can be seen in the upper left. In this image, the colors represent different ranges of X-rays with red, green, and blue representing, low, medium, and higher X-ray energies. Credit: NASA/CXC/GSFC/U.Hwang et al. 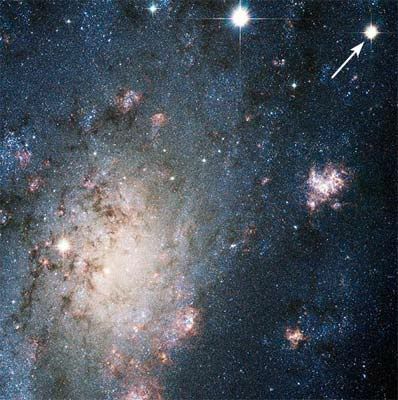 A University of California, Berkeley, astronomer has turned the NASA Hubble Space Telescope on the brightest and nearest supernova of the past decade, capturing a massive stellar explosion blazing with the light of 200 million suns. The explosion of a massive star blazes with the light of 200 million Suns in this NASA Hubble Space Telescope image. 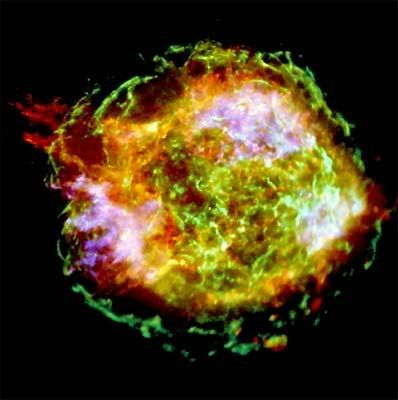 The arrow at top right points to the stellar blast, called a supernova. Credit: NASA, ESA, A.V. 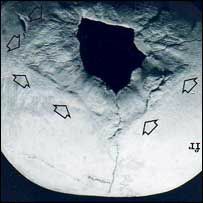 Filippenko (University of California, Berkeley), P. Challis (Harvard-Smithsonian Center for Astrophysics), et al. The supernova, called SN 2004dj, is so bright in the Hubble image that it easily could be mistaken for a foreground star in our Milky Way Galaxy. Yet it lies 11 million light-years from Earth in the outskirts of a galaxy called NGC 2403, nestled in a cluster of mostly massive bright blue stars only 14 million years old. 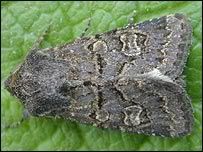 British moths are in serious trouble, possibly because of changing climate, a scientist will reveal later this week. 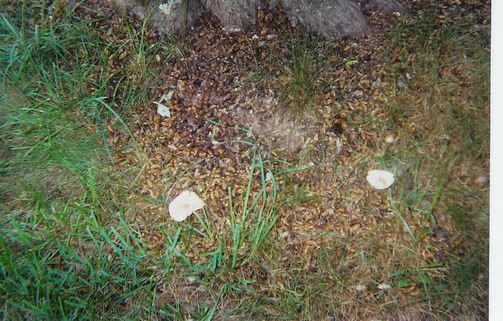 Dr Kelvin Conrad of Rothamsted Research will tell the British Association's annual meeting in Exeter that about two-thirds of UK moths are declining. 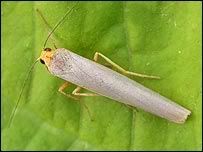 He says about a fifth of all British moths are losing numbers sharply enough to cause conservationists concern. 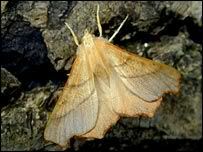 Moths are seen as a good indicator of the general health of the environment, because they occupy most habitats. Rothamsted Research, north of London, is the UK's largest agricultural research centre. Dr Conrad will be presenting data from a 35-year study of moths caught in Rothamsted's nationwide network of light traps to the BA Festival of Science on 9 September. In this detailed view from NASA's Hubble Space Telescope, the so-called Cat's Eye Nebula looks like the penetrating eye of the disembodied sorcerer Sauron from the film adaptation of "The Lord of the Rings." The nebula, formally cataloged NGC 6543, is every bit as inscrutable as the J.R.R. Tolkien phantom character. Though the Cat's Eye Nebula was one of the first planetary nebula to be discovered, it is one of the most complex such nebulae seen in space. A planetary nebula forms when Sun-like stars gently eject their outer gaseous layers that form bright nebulae with amazing and confounding shapes. 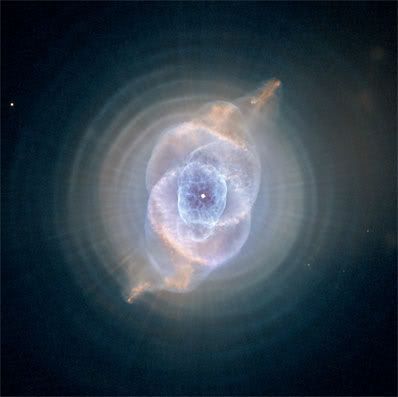 As if the Cat's Eye itself isn't spectacular enough, this new image taken with Hubble's Advanced Camera for Surveys (ACS) reveals the full beauty of a bull's eye pattern of eleven or even more concentric rings, or shells, around the Cat's Eye. Each 'ring' is actually the edge of a spherical bubble seen projected onto the sky -- that's why it appears bright along its outer edge. Observations suggest the star ejected its mass in a series of pulses at 1,500-year intervals. These convulsions created dust shells, each of which contain as much mass as all of the planets in our solar system combined (still only one percent of the Sun's mass). These concentric shells make a layered, onion-skin structure around the dying star. The view from Hubble is like seeing an onion cut in half, where each skin layer is discernible. To see a world in a grain of sand. A nearby galaxy cluster is facing an intergalactic headwind as it is pulled by an underlying superstructure of dark matter, according to new evidence from NASA's Chandra X-ray Observatory. Astronomers think that most of the matter in the universe is concentrated in long large filaments of dark matter and that galaxy clusters are formed where these filaments intersect. 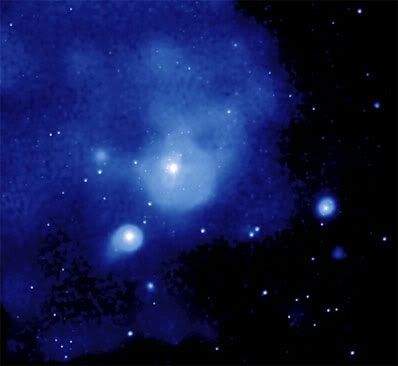 A Chandra mosaic of images of the Fornax galaxy cluster reveals that the vast cloud of ten-million-degree Celsius gas surrounding the cluster core has a swept-back cometary shape that extends for more than half a million light years. This geometry suggests that the hot gas cloud is moving through a larger, but less dense cloud of gas, creating a ram pressure, or intergalactic headwind. Credit: NASA/CXC/Columbia U./C.Scharf et al. Nanotechnologists envision using tiny structures to create ultrastrong materials and to build memory chips that store entire libraries. But these visions require making matter behave in exceptionally orderly ways. NEAT TRICK. 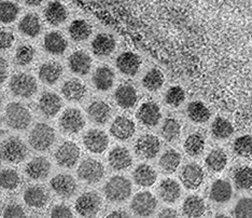 Orderly arrays of nanodots are spawning new materials and light-emitting devices. 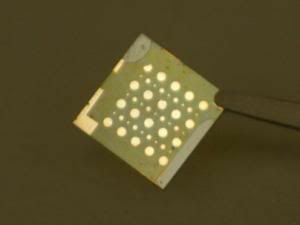 Only 7 nanometers across, these nickel dots occupy an aluminum-oxide matrix. Now, materials scientists Jagdish Narayan and Ashutosh Tiwari of North Carolina State University (NCSU) in Raleigh have induced tiny particles, or nanodots, of nickel to spontaneously assemble into exceptionally uniform, three-dimensional arrays of macroscopic size. With this method, they've also created blends of copper nanodots and tin that they say are harder than steel. The company Kopin in Taunton, Mass., is already applying the technique to semiconductors that they use to manufacture unusually efficient light-emitting diodes. Narayan and Tiwari describe their work in the September Journal of Nanoscience and Nanotechnology. A stunning image released by the Gemini Observatory captures the graceful interactions of a galactic ballet, on a stage some 300 million light years away, that might better be described as a contortionist's dance. 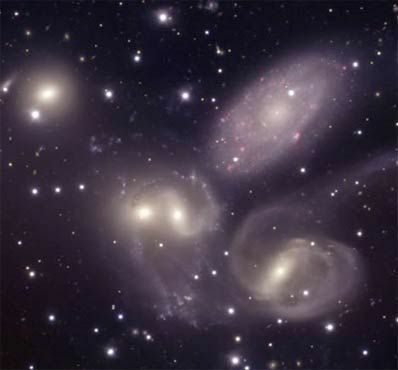 The galaxies, members of a famous troupe called Stephan's Quintet, are literally tearing each other apart. Their shapes are warped by gravitational interactions occurring over millions of years. Sweeping arches of gas and dust trace the interactions and possible ghost-like passage of the galaxies through one another. The ongoing dance deformed their structures while spawning a prolific fireworks display of star formation fueled by clouds of hydrogen gas that were shocked into clumps to form stellar nurseries. 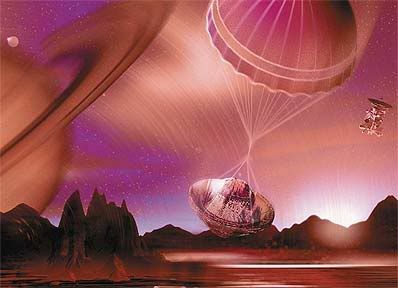 ESA's Huygens probe, now orbiting Saturn on board the NASA/ESA/ASI Cassini spacecraft, is in good health and successfully passed its fifteenth 'In-Flight Checkout' on 14 September 2004. This in-flight checkout procedure was the last but one planned before separation of the Huygens probe from Cassini in December this year, and it included some specific activities that were intended to prepare for the separation. The main difference in this procedure from previous checkouts was that there was a test of the Master Timer Unit (MTU). For the first time, MIT researchers have incorporated a plant’s ability to convert sunlight to energy into a solid-state electronic “spinach sandwich” device that may one day power laptops and cell phones. At the heart of the device is a protein complex dubbed Photosystem I (PSI). Derived from spinach chloroplasts, PSI is 10 to 20 nanometers wide. Around 100,000 of them would fit on the head of a pin. “They are the smallest electronic circuits I know of,” said researcher Marc A. Baldo, assistant professor of electronic engineering and computer science at MIT. An international team of scientists, led by a NASA-funded researcher, announced today, they observed a nearby head-on collision of two galaxy clusters. The clusters smashed together thousands of galaxies and trillions of stars. It is one of the most powerful events ever witnessed. Such collisions are second only to the Big Bang in total energy output. The fossilized neck bones of a 230-million-year-old sea creature have features suggesting that the animal's snakelike throat could flare open and create suction that would pull in prey. 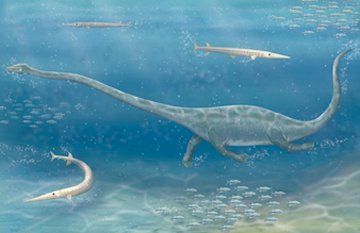 Such a feeding strategy has never before been proposed for an ancient aquatic reptile. THAT'S A STRETCH. Features of the fossilized neck bones of Dinocephalosaurus suggest that the creature, at least 3 meters long, captured its prey by creating water suction as it struck. 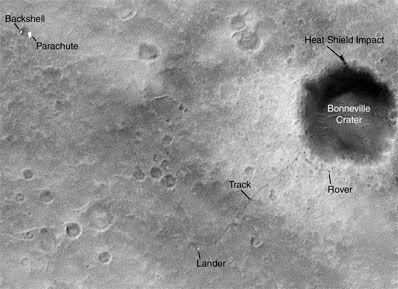 NASA's Mars Global Surveyor, starting its third mission extension this week after seven years of orbiting Mars, is using an innovative technique to capture pictures even sharper than most of the more than 170,000 it has already produced. 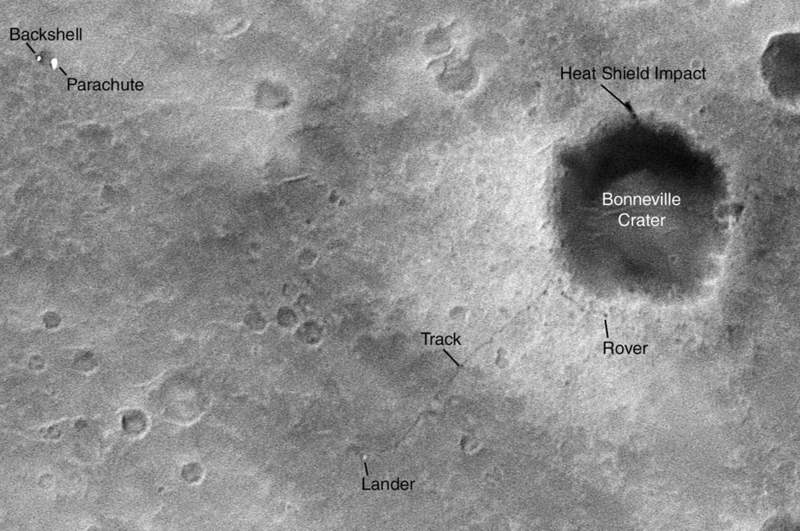 One dramatic example from the spacecraft's Mars Orbiter Camera shows wheel tracks of NASA's Mars Exploration Rover Spirit and the rover itself. Another tells scientists that no boulders bigger than about 1 to 2 meters (3 to 7 feet) are exposed in giant ripples created by a catastrophic flood. Surgeons were carrying out complicated skull operations in medieval times, the remains of a body found at an archaeological dig show. A skull belonging to a 40-year-old peasant man, who lived between 960 and 1100AD, is the firmest evidence yet of cranial surgery, say its discoverers. The remains, found in Yorkshire, show the man survived an otherwise fatal blow to the head thanks to surgery. Nearly 700 skeletons were unearthed by English Heritage at a site near Malton. "DNA Diets" : Are they junk science? Can you still donate your body to science? Are there any "bits" they don't want? "Simple" Rocket Science: Where have I gone wrong? Is "accelerating through the apex of a turn for more control" sound science? Page created in 0.109 seconds with 77 queries.